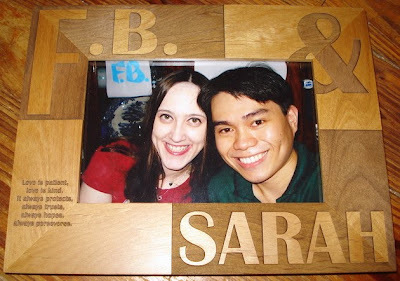 I ordered this gorgeous wood engraved frame from Personalization Mall.com. I also ordered a few more as gifts for family. 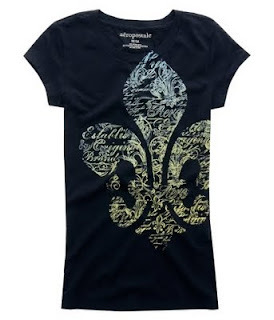 I think it's absolutely gorgeous! (They shipped out my order fast too.) The frames were only $18 each and you can customize it with whatever text you want. The wood engraving turned out beautiful! 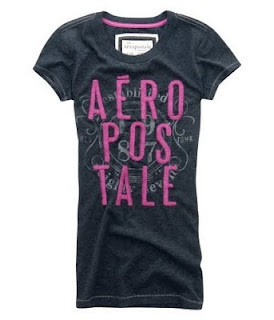 I also ordered 3 cute t-shirts for my Philippines trip from Aeropostle. 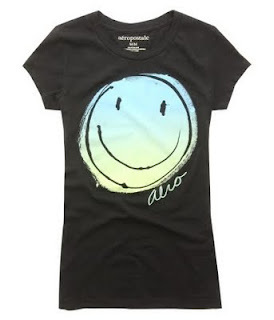 I love the smile face tee! In Philippine updates: F.B. & his family are slowly getting the house cleaned up & back to normal. F.B. says the house is like a puzzle right now, that things aren't in their places. He went to Dad's Ultimate Buffet for his 30th birthday (Which is also part of Saisaki buffet.) I told him to eat alot of sushi & tempura for me, hehe! I love Saisaki Buffet! Their California Roll has mango in it! So good, yum! We got to talk on the phone on his birthday. And Sunday he was at Mall of Asia again at an internet cafe so we got to talk online again too around 1:30am (Philadelphia time). F.B. 's father is supposed to come home November 15th. His father is a ship captain & is only home a few months out of the year. He brings shipments of fruits, veggies, flowers, cars, etc; to other countries, (USA included.) Earlier this year he was taking shipments of fruit from Coasta Rica to Philadelphia. But because of the strict rules, he wasn't allowed to leave the ship yard so we didn't get to meet up. I had the craziest dream last night. I dreamed I arrived in the Philippines and pretty much forgot to pack anything & everything! I opened my suitcase and there was a few clothing items scattered around in my suitcase and I turned to F.B. 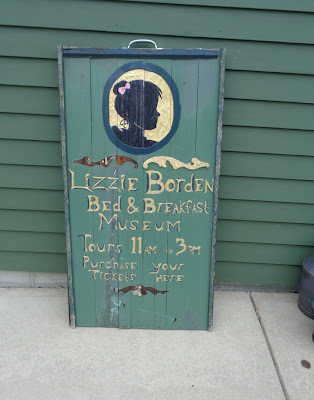 and went, "I don't know how this happened... but I forgot to pack pretty much everything!" In my dream, I ended up calling my Mom with a list of things I needed and told her to use my credit card to ship my clothes & stuff to me. What a weird dream! I don't think I've ever forgotten to pack, and if I did forget something I could always buy it in the Philippines!